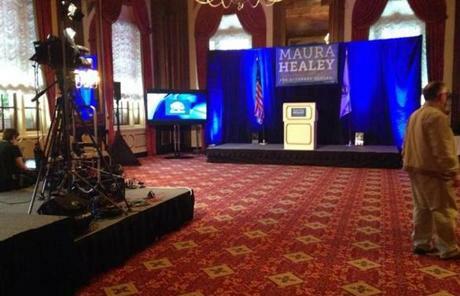 Maura Healey primary party location was empty before polls closed. 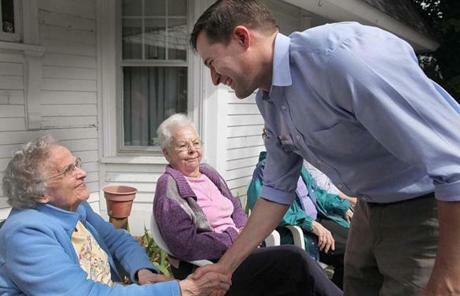 Democratic congressional candidate Seth Moulton greeted Marjorie Needham during a campaign stop at Girdler House in Beverly. 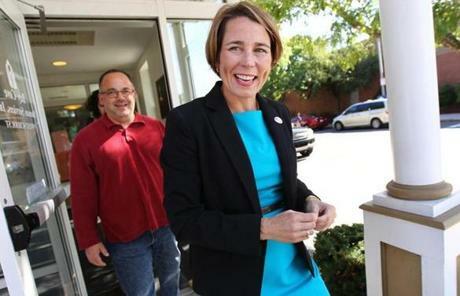 Attorney general candidate Maura Healey walked out of the Zelma Lacey House after voting in Charlestown. 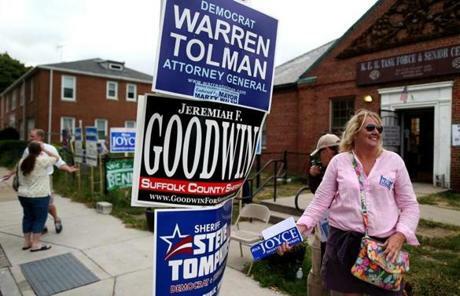 Signs on display in South Boston. 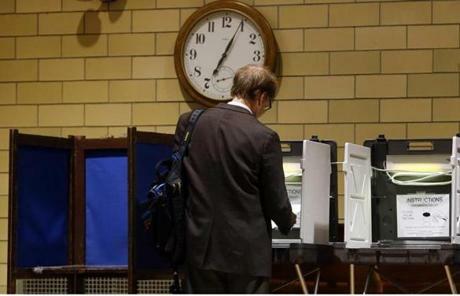 A man voted at St. John's Church in Salem. 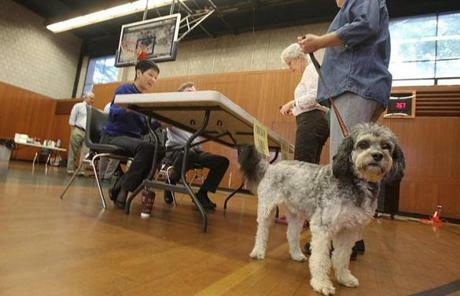 Abby Cohen, with her dog Jazzie, voted at Hyde Community Center in Newton. 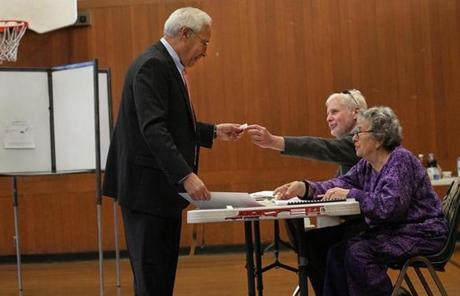 Democrat Don Berwick got a sticker after he voted at Hyde Community Center. 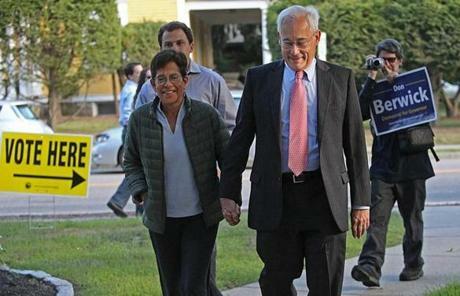 The gubernatorial hopeful was accompanied by his wife, Ann. 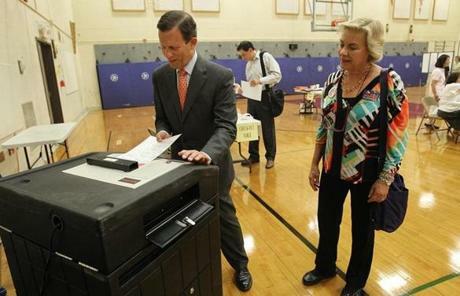 Steve Grossman and his wife, Barbara, voted at Bigelow Middle School in Newton. 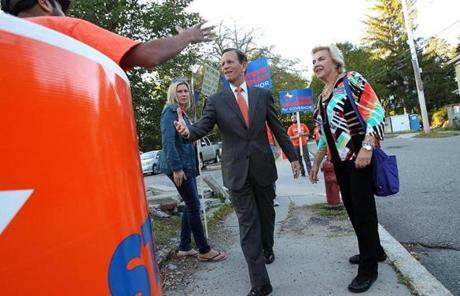 The Democratic gubernatorial candidate shook hands with a supporter outside the school. 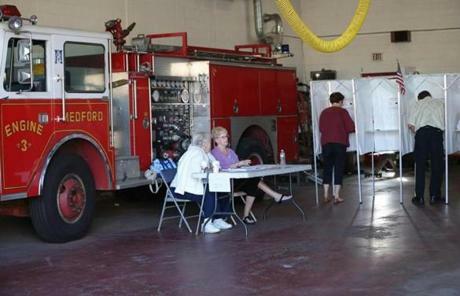 At the Medford fire station on Harvard Avenue, voters were trickling in this morning. 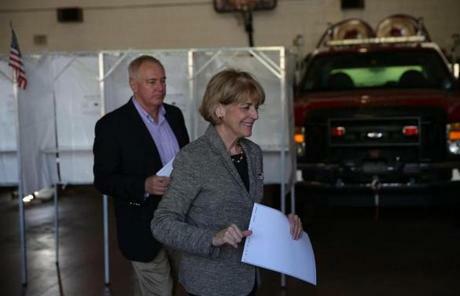 Democratic gubernatorial hopeful Martha Coakley voted in Medford with her husband, Tom O’Connor. 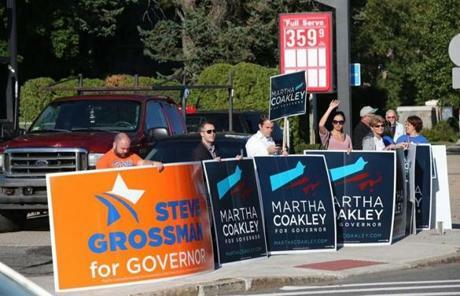 Candidates’ signs were visible on High Street in Medford. 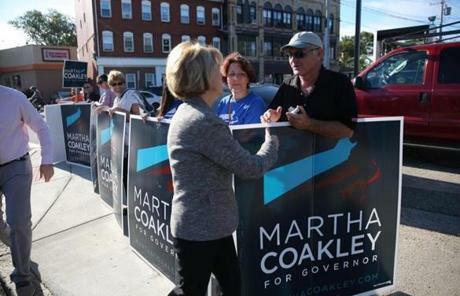 Coakley shook hands with Bill Young after voting. 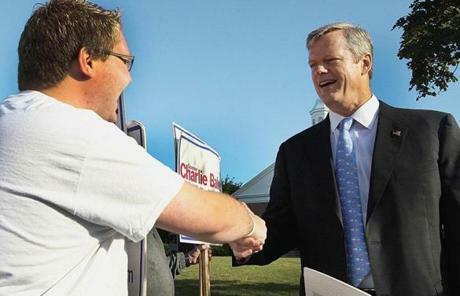 GOP gubernatorial hopeful Charlie Baker voted in Swampscott this morning. 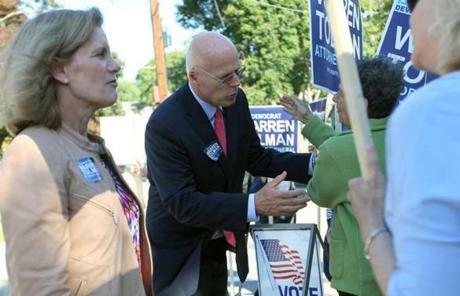 Democratic AG candidate Warren Tolman greeted sign holders in Watertown. 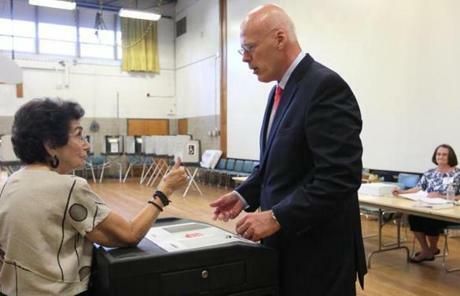 Tolman voted at the Phillips School. 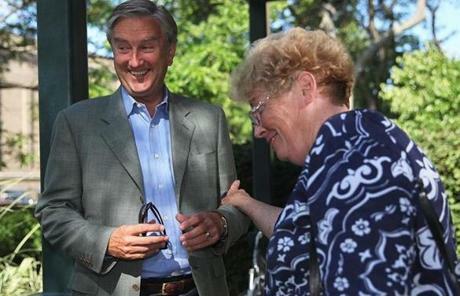 US Representative John Tierney talked to voters in Lynn this morning. 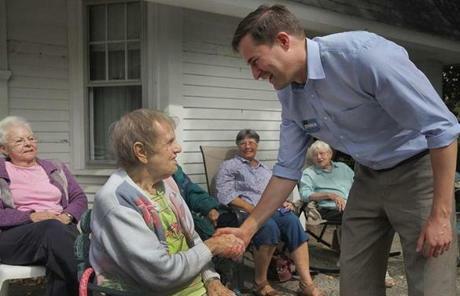 Seth Moulton visited residents at the Girdler House in Beverly. 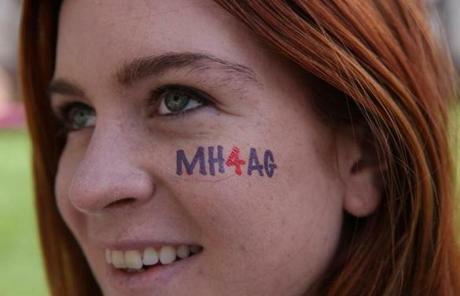 Allie Owen, of Cambridge, had a temporary tattoo under her eye supporting AG hopeful Maura Healey. 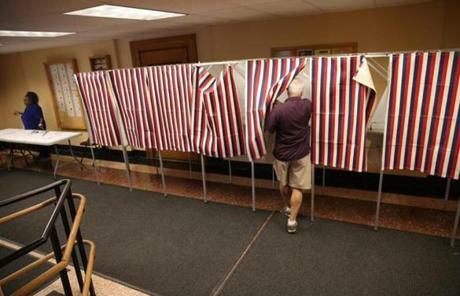 A lone voter entered the booth in the basement of Cambridge City Hall. 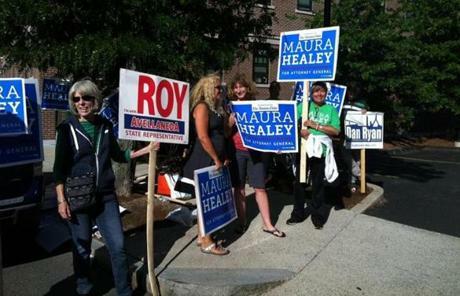 Maura Healey backers were among those showing their support in Charlestown.